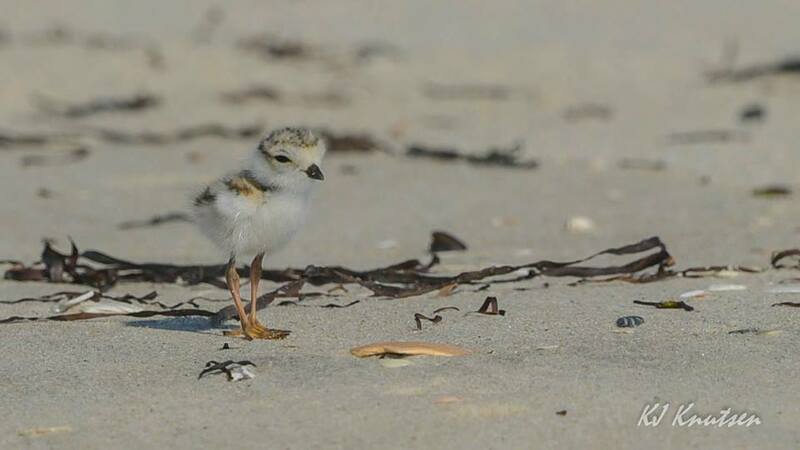 One of four recently hatched “itty-bitty” piping plover chicks at Island Beach State Park. Photo courtesy of Kevin Knutsen. 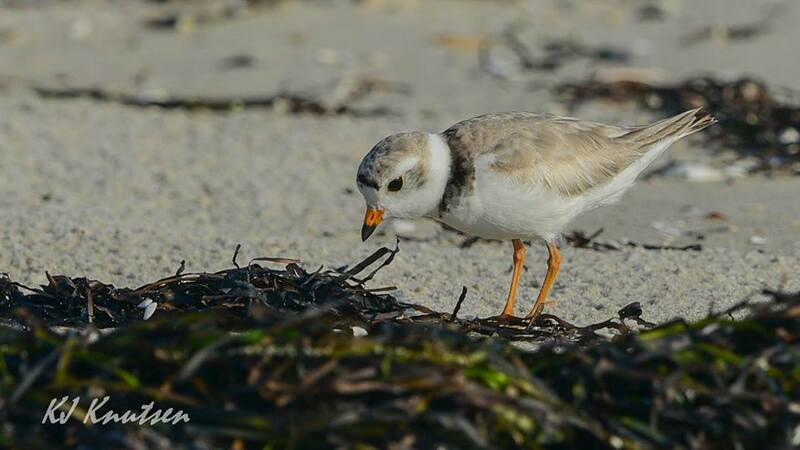 So far our weekly beach nesting bird updates have focused on statewide trends, but this week we are going to feature one special pair of piping plovers. The story actually starts in the summer 1989…Ronald Reagan had just left the White House and the Berlin Wall would fall a few months later. It was also the last time a piping plover nested on the miles of oceanfront beaches at Island Beach State Park. That all changed in May of this year, when a pair of plovers was observed exhibiting breeding behavior at the southern portion of the park close to the inlet jetty. Eventually they laid four eggs, a cage was erected around the nest to protect it from predators, and right on schedule over the July 4th weekend, four itty-bitty chicks emerged. A week later, three chicks have survived the daily battles with predators (i.e. fox, crows, gulls) and a heat wave. The story isn’t over yet, we won’t know for another 3 weeks or so if they survive to the stage where they can fly, which is our metric for success. Regardless of the outcome, this pair being at Island Beach State Park symbolizes an interesting point in New Jersey’s conservation efforts to recover this federally threatened and state endangered species. 2016 marks the 30th anniversary of federal listing for the Atlantic coast population of piping plovers, and with it extensive management to aid recovery. Those management efforts have led to varying results in New Jersey; our population has swung from a low of 92 pairs to a high of 144 pairs, but mostly settling in around 120 pairs. We are currently in a slight upswing, but the bottom line is New Jersey is a tough place for piping plovers to successfully breed – it represents a convergence of all the significant threats the birds face. Why did piping plovers suddenly show up at Island Beach State Park again this year? Well, we may never know for sure, but we do think Hurricane Sandy probably had a part in it. While it was wrecking destruction up and down the Jersey Coast, Hurricane Sandy was also creating the kind of sparse, open habitat where piping plovers prefer to nest. Some of that was created at Island Beach, and soon after Sandy, we noted some “prospecting” plovers at the park. Nothing came of that, but meanwhile piping plover action was heating up just a little bit south on LBI at the Holgate Unit of the Edwin B. Forsythe NWR and just across the inlet at Barnegat Light. The storm created especially good conditions for piping plovers in those locations, including a giant “overwash” at Holgate, which in turn attracted more and more plovers, which produced a “bumper crop” of young fledglings. Barnegat Light only had one remaining plover, but it produced well above average numbers of fledglings for several years in a row. One of the newest “residents” of Island Beach State Park, an adult breeding piping plover. Photo courtesy of Kevin Knutsen. Quick biology lesson…piping plovers exhibit very strong site fidelity, so the adults tend to come back to the same site year after year, often the same patch of beach. That includes their young, but they have to forge their own territory as existing pairs fiercely defend their established territory. This year we have seen a bump from one to four pairs in the Barnegat Inlet area and one of the new breeding birds was born last year at Holgate (we know that from bands now being placed on the birds by researchers). With Holgate reaching capacity, the returning young are looking nearby for other places to nest. The Island Beach plovers are not banded, but the banding in this area is new in our state, so they might also be young from previous successful nests at Barnegat Light. At the moment New Jersey has high concentrations of piping plovers at Sandy Hook and the Forsythe NWR, over three-quarters of the state population occurs at these federal properties. They are performing well at these sites for now, but habitat conditions change quickly along the coast and real recovery has to happen over a wider geographic area. For any significant population rebound to occur, new sites need to be colonized, so the piping plovers at Island Beach State Park this year may be a small sign of that starting to happen.